This solar eclipse has been called "The Great American Eclipse! ", the "National Eclipse " , the "US Eclipse", and the "American Eclipse" because the eclipse path begins at the western coast of the United States of America in the Pacific state of Oregon. (Please note that the phrase "Great American Eclipse" is a registered word mark.) It passes the entire width of the country until it drops off the land at the eastern coast of South Carolina. The entire event lasts a mere 4 hours and 5 minutes from the instant of first bite in Oregon to the last bite visible in South Carolina. This eclipse will be the first total solar eclipse visible from the contiguous United States since the total solar eclipse of February 26, 1979. So what is a solar eclipse, anyway? A total solar eclipse can only occur during a new moon when the Moon is in front of the Sun and the entire surface facing the Earth is not illuminated by the Sun. But for a solar eclipse, the Sun and the Moon are perfectly aligned as viewed from a location on the surface. When this happens, darkness comes on Earth where ever the Moon's full shadow falls. Have you ever noticed that the disk of the Sun and the Moon appear to be about the same size in the sky? In fact, they are very close. The Earth and the Moon are in orbit around the Sun, in addition the Moon is orbiting the Earth. Orbits are always ellipses, although some may be nearly circular. In an elliptical orbit, there are two points, one at the closest distance and another at the furthest. This means that the disks of the Moon and Sun are slightly larger at the close point (we use the term "peri-"), and slightly smaller at the far point (we call that "ap-"). In addition the Moon’s orbit is inclined to the ecliptic by 5 degrees, that is the plane of the Earth’s orbit around the Sun. This means that the Moon moves north and south in relation to the Earth's equator like a yo-yo on a string. Only when the Sun and the Moon are at the same point on the ecliptic (called nodes) can an eclipse occur. If the Moon was in a perfect orbit above Earth's equator, every moonth (month) would bring a total solar eclipse. When the Sun, Moon, and Earth are all at that same point, the term "syzygy" is used. This term means that three bodies are at that special intersection point. It's a fun word that you may hear used to describe a solar or lunar eclipse. (But you can't use it for Scrabble™ because there are three y's.) Because all of the orbits are stable, this happens on a regular basis, about every 6 months, that is called an eclipse season. There are approximately 2 eclipse seasons per year. A total solar eclipse occurs when the Moon is closest to the Earth, we use the term perigee. If the Moon is closer to apogee, a different kind of eclipse occurs; that is called an annular eclipse because the Sun's disk pokes out from behind the moon's disk and appears as a ring of light. There is no total darkness even when the Moon is perfectly centered in front of the Sun. Whenever the Moon does not completely cover the disk of the Sun, it is called a partial eclipse. 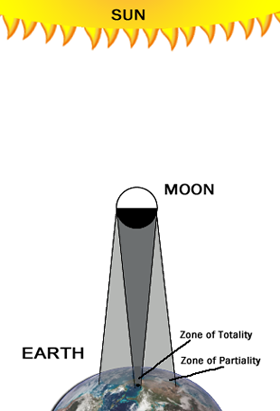 During any total eclipse localities not on the umbral path will see only a partial eclipse. The best solar eclipses occur when the moon is at perigee and the Earth is at aphelion. For any total solar eclipse, there is a limited area of the Earth's surface that is crossed by the Moon's shadow. The Moon's shadow is called the umbra, and the distance on Earth the eclipse shadow travels is called the umbral path or path of totality. It is never more than about 100 miles wide and 10,000 miles long, these figures vary for each individual eclipse. (This is about 160 km by 16,000 km) In contrast, the large shadow of the Earth covering the Moon during a lunar eclipse allows a much greater region of the Earth's surface to experience the darkening of the Moon's disk. The lighter shadow as shown in the diagram is called the penumbra. The August 21, 2017 total eclipse is a part of Saros cycle 145, repeating every 18 years, 11 days, or 223 lunar months. The Saros cycle was developed for lunar eclipses, but they have been successfully employed for solar eclipses as well. The Saros cycle is really a series of eclipses and more than one Saros cycle has been identified. (At any given time around 40 saros cycles are producing eclipse events.) It is interesting that Chaldean astronomers are thought to be the first humans to figure this out based on their desire to accurately predict when eclipses will occur. Saros cycles begin with eclipses near the north pole and gradually shift southward along the globe of the Earth until the last eclipse occurs near the south pole. Not all of the eclipses in a saros cycle are total eclipses, there are many annular and partial eclipses in the series as well. It is funny that many accounts of total solar eclipses describe scenes of bedlam among primitive natives. Some of them have been reported to make a lot of noise to scare away the frightful spirits that have caused the Sun to vanish. Having been to a couple of total eclipses and watching videos from countless others, I must remark that “modern” people make as much noise and get just as crazy during totality as well! The particular eclipse that will occur on August 21, 2017 has the capacity to be viewed by millions as long as the weather holds true for the 12 states along the U.S. of A. where totality will make an impressive impact. There is nothing like a total solar eclipse, darkness in daytime. During totality, it is possible to look directly at the Sun. And only during totality! Even a small fraction (1%) of the solar disk can burn out the human retina. So as always, use proper filters and take care during an eclipse. One more thing, if you stay outside during the entire eclipse, be sure to wear sunscreen. I've been burnt more than once during eclipses! The April 17, 2017 total solar eclipse occurs when the Moon is 3 days past perigee while the Earth is about 6-weeks past its aphelion point 152,092,504 km away from the Sun (July 3). The Sun is currently in Solar Cycle 24 and is moving toward the minimum end of its 11-year cycle as the last Maximum was determined to have occurred in 2014. Currently there have been spotless days and the next projected Minimum is 2019-2020. To date, in 2017 solar activity is nearly as low as it was during the 2009 minimum. Hopefully, in August the situ at on may have improved and we might get to see some sunspots during the August eclipse. The phenomena of total solar and lunar eclipses are often called "rare" events. Although they are rare, the occurrence of these is due to the regular and stable orbits of the Moon and the Earth. Attached to each other due to the observable effect of gravity, the planet Earth and its Moon have been orbiting our Sun for millions of years, perhaps as long as 4.5 billion years. Their orbits are regular and steady, they are considered to be in stable orbits. This consistent orbital motion is measurable and that means solar and lunar eclipses can be calculated. Eclipses are the product of regular orbits, and observers on the surface of Earth are treated to the spectacles on regular, calculable cycles. (or even series of cycles) For observers at the surface, the orbits are quite complicated so that many arguments must be known to make accurate predictions. The point is, they are predictable. Eclipses are not omens sent to humans by omniscient gods or other entities. They don't predict the fall of nations or tell you if you are going to get a new job. The same is true for other astronomical phenomena like planetary conjunctions. These phenomena are caused by a mechanical process that is well understood by astronomers and physicists. I only wish that this video would show the whole eclipse path to the Atlantic Ocean on the eastern seaboard. There is nothing like the period of totality during a solar eclipse. For many US citizens, this may be the only chance that this experience can touch their lives. I cannot urge you more strongly to find out what happens when the Sun disappears from the sky in broad daylight.